San Clemente State Beach campground has 160 campsites (69 with full hookups). Each campsite has a table, fire ring and grill. Some of the campsites have shade structures. The campground has an amphitheater, flush toilets, hot showers, a dump station and picnic area. There’s a lot of nice campsites – both with and without hookups. Two group campsites are also available (50 people per site). Campsites 1 to 72 are the full hookup sites. The majority of these campsites will accommodate RVs & trails up to 42 feet. Campsites 4 and 5 are limited to 36 feet and sites 57-59 are limited to 32 feet. We’ve listed our favorite San Clemente State beach campsites based on location in the campground and privacy. San Clemente State Beach is located right in the town of San Clemente and has been one of the most popular beaches in California. The mile long beach stretches between the ocean surf and the foot of a steep bluff. There’s lots to do here including camping, swimming, surfing, snorkeling, beach combing, hiking, surf fishing, biking, whale watching or even cruising into town to shop and hit up a few restaurants. Other nearby campgrounds to consider include Doheny State Beach, San Mateo and San Onofre Bluffs. Visted San Clemente State Beach Campground lately? We'd love to hear about your adventure. Did you find us useful? Did we forget something? Anything our community should know before heading out to San Clemente State Beach? What are the best campsites on this park? I see we did not list our favorite campsites at San Clemente State Beach. Let me get with the crew and we will post those on the San Clemente web page early next week. There’s a lot of nice campsites at San Clemente State Beach. Several good sites with and without hookups. Our San Clemente State Beach campground page has a list of our favorite/best campsites. 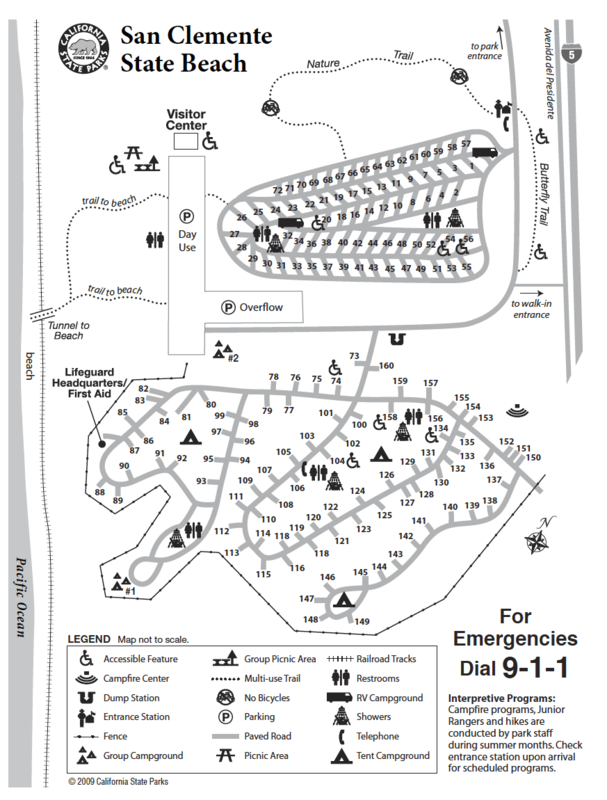 I have reservations for site #84 and #97 at San Clemente State Beach. Which site would you recommend to gather with the rest of our party? I think San Clemente State Beach campsite #97 has a little more room for your gathering and also offers glimpses of the ocean. All California State Parks have a reservation schedule that is 6 months out from the day of arrival. So (for example), for San Clemente State Beach if you wanted to arrived on July 1, the first day you could make a reservations would be on January 1 (at 8am PST). 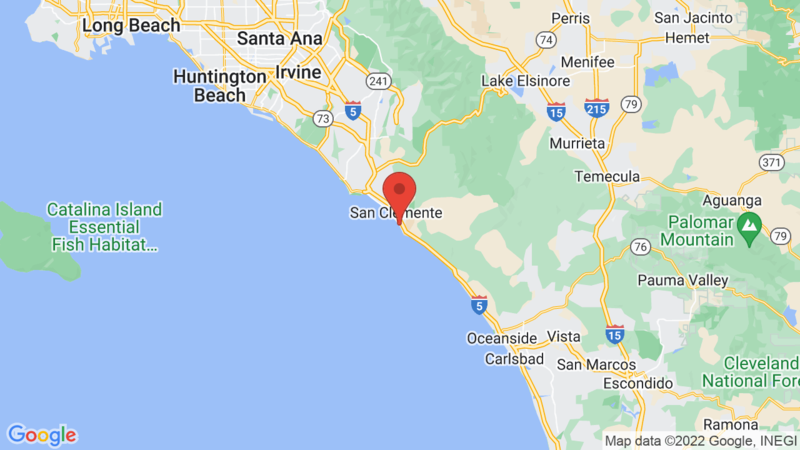 The ‘Make A Reservation’ button on the San Clemente State Beach Campground page will link you to ReserveCalifornia to check availability and make a reservation. FYI – the campground will usually sell out within 2-3 minutes for summer date arrivals. We’re needing to rent our rv thru Luv2Camp and the size we need is 31ft. Is this going to be a problem? It says 30ft on the San Clemente SB campground website but I see conflicting info. Help, lol! We’ll be in site 69. At San Clemente State Beach campground, campsites 1 to 72 are the full hookup sites. The majority of these campsites will accommodate RVs & trails up to 42 feet. Campsites 4 and 5 are limited to 36 feet and sites 57-59 are limited to 32 feet. For campsite 69 (per ReserveCalifornia.com), the site pad length is 38 feet so you should be fine. Thank you! Can’t wait to get there.